“Leaving behind my writing brush and / removing my sword, I came to America. Who was to know two streams of tears would / flow upon arriving here?” (Poem 35). These were the words written by a Chinese immigrant detained at Angel Island Immigration Station. Reading these words 80 years later, I could still feel the pain and loneliness that was translated into verse at the time of those traumatic events. Immigrants were detained over long periods of time, during which they were separated from their families and forced to stay in cramped cells, often awaiting deportation. The confined prisoners, angry at their mistreatment by the American government, expressed themselves by writing classical Chinese poetry on the prison walls. The poems were virtually unknown to the public until they were discovered by a park ranger in 1970 when the station was about to be demolished. After the discovery of these poems, Him Mark Lai, Genny Lim and Judy Yung compiled, translated and published the poems in the book “Island: Poetry and History of Chinese Immigrants on Angel Island, 1910-1940” in 1982. When you type in the word “immigrant” into an online thesaurus, the following synonyms come up: “newcomer,” “settler,” “foreigner,” “migrant.” But the most jarring one is “alien.” The term “alien” is commonly associated with illegality — undocumented immigrants whose existence in the country has been deemed unlawful. Chinese immigrants at Angel Island lived such existences. During this time, the United States also saw an influx of immigrants from Russia, the Philippines, Australia, New Zealand and Mexico. Upon their arrival in San Francisco, those immigrants, along with the Chinese, were separated from other European or American travelers, and then transferred to Angel Island. As the American economy faced a slump in the 1870s, the Chinese Exclusion Act of 1882 was signed by Congress in an effort to prevent Chinese laborers from landing in the United States and competing with the local labor force.Laws were also passed at local and state levels that targeted the Chinese, which made it especially hard for them to gain legal status. The terms “paper sons” and “paper daughters” were often used to refer to Chinese immigrants — in order to pass through interrogations, they often claimed they had familial connections to Chinese American citizens. Yet in reality, many had left their families in China, a country that at the time was ridden with civil strife and agrarian poverty. Failure to truthfully answer questions about their family history often resulted in deportation. A number of these immigrants came from southern China, notably Toishan District in Guandong province, a region suffering from natural disasters and a struggling economy. Many also came from peasant backgrounds, but the poetry, carved into the wooden walls of the station, nevertheless reveals striking eloquence and literacy. These poems give us an insight into a typical day for the imprisoned: “Being stabbed for blood samples and / examined for hookworms was even more / pitiful. After taking the medicine, I also drank / liquid, / Like a dumb person eating the huanglian” (Poem 49). Immigrants applying for entry were examined for hookworms, and those who were infected were deported. 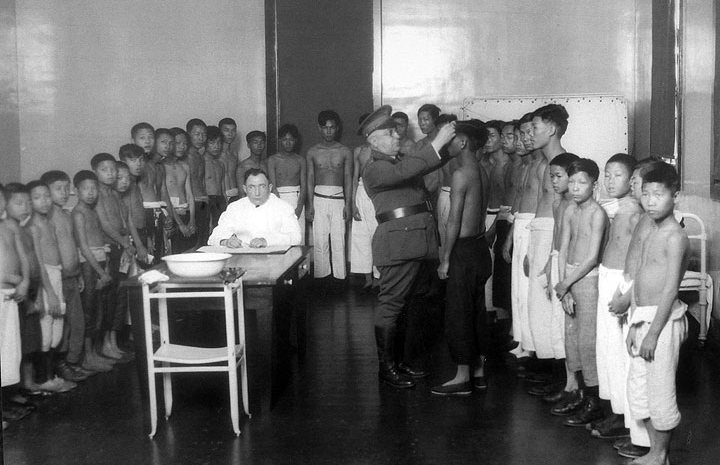 The prisoners were reduced to passive subjects, expected to adhere to strict orders while their bodies were cruelly examined to measure their adequacy for legality. Beyond the dehumanization of inmates, the poems reveal a people bereft of dignity, longing for their native land: “For what reason must I sit in jail? / It is only because my country is weak and / my family poor… Even if my petition is approved and I can enter the country / When can I return to the Mountains of Tang / with a full load?” (Poem 34). In some of these poems, Chinese inmates lamented the fragmented state of their native country — over the course of 30 years, China witnessed a period of violent wars and internal conflict, including the Second Sino-Japanese War, which killed more than 9 million civilians. When home was no place to turn to, immigrants were forced to find new places to seek refuge; inmates expressed sentiments of anger, desire for revenge and hope for new beginnings through the simple elegance of Chinese calligraphy, painting their empty dreams. The surge of Chinese immigrants into the United States triggered anxiety in the American psyche — a fear that inspired the racist metaphor known as “Yellow Peril” — as citizens imagined hordes of foreigners threatening the “American” way of life. Yellow Peril invoked imagery of villainy, undesirability and malevolence; examples include cartoon figures such as Dr Fu Manchu and Ming the Merciless from the early 20th century. This devilization of a group can still be seen today with President Trump’s travel ban and the stigmatization of Islam in Western society. Targeted fear and xenophobia in America are surviving sentiments — Trump’s statement describing immigrants from “shithole countries” parallels the prejudiced attitudes taken toward Chinese immigrants in the 1930s. The Chinese Exclusion Act was not the last time the American government would curtail immigration through discriminatory agendas — Trump’s promise to his supporters that he would cut Mexican immigration alarmingly suggests we have not learned from the past. The Angel Island Immigration Center finally came to its end Nov. 5, 1940, when the Administration Building burned down. The building that housed female detainees was consumed in the fire, destroying any remnants of the poetry they may have written. Simultaneously, American relations with China significantly improved as the two countries became allies in World War II. But the national anxiety that arose after the bombing of Pearl Harbor in 1941 led to feelings of prejudice and anger toward the Japanese — negative sentiments once directed at Chinese immigrants were redirected to another class of American citizens. In 1942, President Franklin D. Roosevelt signed Executive Order 9066, allowing authorities to remove anyone who could threaten the war effort and place them in internment camps sprinkled throughout the country. As a result, tens of thousands of Japanese Americans were sent into internment camps, such as Manzanar in California, continuing an ongoing pattern in American History. Nowadays, Angel Island is a popular tourist spot, while ICE raids are carried out every day in homes, workplaces, and schools. Visitors gaze at the cells with wonder before continuing on, unable to imagine the torment experienced by the inmates who once occupied the space. But the silent characters that remain on the walls act as reminders that, even after more than half a century, racism and discrimination have not yet been left behind.